Jupiter, Venus and the Moon over Los AngelesCredit: Matt HartmanSkywatcher Matt Hartman caught Jupiter, Venus and the Moon over Los Angeles, Feb. 25, 2012. Jupiter, Venus and the Moon over West Chester, PACredit: Jeff BerkesSkywatcher Jeff Berkes took this image of Jupiter, Venus, and the moon with a dramatic skyscape and foreground trees in West Chester, PA, Feb. 26, 2012. Jupiter, Venus, the Moon, and Star TrailsCredit: Roberto PortoRoberto Porto captured Jupiter, Venus and the moon with star trails in the Canary Islands, Spain, Feb. 24, 2012. Venus-Moon-Jupiter Conjunction over Bradley Beach, NJCredit: Jack FuscoSkywatcher Jack Fusco enjoyed viewing Jupiter, the moon and Venus while sitting on a bench at Bradley Beach, NJ, near Sylvan Lake, Feb. 26, 2012. Jupiter, Venus, Moon and MercuryCredit: John Green & The ULAO Project.Skywatcher John Green caught the Jupiter-Venus-Moon conjunction, and throws in Mercury as well. (Mercury is faintly visible at lower center just above the trees.) Photo taken on Feb. 26, 2012, near Mooresville, NC. Jupiter, Venus and the Moon with Goalposts over Kent. CTCredit: Scott TullySkywatcher Scott Tully captured Jupiter, Venus and the moon with goalposts in Kent, CT, Feb. 26, 2012. Jupiter, Venus and the Moon over Kent. CTCredit: Scott TullySkywatcher Scott Tully captured Jupiter, Venus and the moon over Kent, CT, Feb. 26, 2012. Moon, Jupiter, and Venus over Harlingen, TXCredit: Esteban J. JimenezSkywatcher Esteban J. Jimenez captured the moon, Jupiter, and Venus over Harlingen, TX., Feb. 26, 2012. Jupiter, Venus and the Moon Seen from Denver, PACredit: Barry L ShuppBarry L Shupp, astrophotographer, sent this image of Jupiter, Venus and the moon, taken on Feb. 25, 2012, from Denver, PA.
Jupiter, Venus, the Moon Seen with a Fisheye LensCredit: Roberto PortoRoberto Porto captured Jupiter, Venus and the moon with star trails using a fisheye lens in the Canary Islands, Spain, Feb. 24, 2012. Venus, Jupiter & Moon over Birmingham, ALCredit: Tommy MosleyJupiter, Venus the moon and Mercury shine in the sunset sky, in this amazing photo snapped by photographer Tommy Mosley in Birmingham, Ala., on Feb. 24, 2012. Moon, Venus & Jupiter over Central Florida`Credit: Bill BietzAstrophotographer Bill Bietz captured the moon, Venus and Jupiter over Central Florida, Feb. 23, 2012. Crescent Moon on Feb. 24, 2012: William OttCredit: William OttNature photographer William Ott snapped this amazing closeup of the crescent moon on Feb. 24, 2012 as it appeared from a woodlands area near Woodstown, N.J.
Jupiter, Venus & Moon Sky Map February 25, 2012Credit: Starry Night SoftwareOn February 25, 2012, the Moon will be close to the planets Venus and Jupiter. Jupiter-Moon-Venus Conjunction over Lisbon, PortugalCredit: Diogo QuirinoAstrophotographer Diogo Quirino saw Jupiter, the moon, and Venus line up over Lisbon, Portugal, on Feb. 23, 2012. Jupiter, Venus & Moon Sky Map February 26, 2012Credit: Starry Night SoftwareOn February 26, 2012, the Moon will be close to the planets Venus and Jupiter. Venus, Jupiter & Moon: Seen by William Ott on Feb. 24, 2012Credit: William OttSkywatcher and nature photographer William Ott snapped this view of the planets Jupiter (top) and Venus shining with a crescent moon on Feb. 24, 2012 in the woodlands surrounding Woodstown, N.J. The Moon, Venus and Jupiter over Mooresville, NC #2Credit: John Green & The ULAO ProjectAstrophotographer John Green caught the moon, Venus and Jupiter over Mooresville, NC, Feb. 23, 2012. Jupiter, Venus and the Moon over Teide National Park, Canary IslandsCredit: Roberto Porto/Diego SearaSkywatchers Roberto Porto and Diego Seara photographed Jupiter, Venus and the moon over Teide National Park, Canary Islands, Feb. 24, 2012. The Canary Islands, part of Spain, lie off the northwestern coast of Africa. The Moon, Venus and Jupiter over Mooresville, NC #3Credit: John Green & The ULAO ProjectAstrophotographer John Green caught the moon, Venus and Jupiter over Mooresville, NC, Feb. 23, 2012. Sky Map of Jupiter, Venus, Moon and Jupiter for Feb. 25, 2012Credit: Starry Night SoftwareThis sky map shows how the planets Mercury, Venus, Jupiter and the crescent moon will appear on Feb. 25, 2012 at 6 p.m. local time, just after sunset, to skywatchers at mid-northern latitudes. The Moon, Venus and Jupiter over Mooresville, NCCredit: John Green & The ULAO ProjectAstrophotographer John Green caught the moon, Venus and Jupiter over Mooresville, NC, Feb. 23, 2012. The Moon, Venus and Jupiter over Denville, NJCredit: Jeff BartkowiakSkywatcher Jeff Bartkowiak took this picture of the moon, Jupiter and Venus on Feb. 23, 2012, in Denville, NJ. The Moon, Venus and Jupiter over Los AngelesCredit: Jackson PharrisSkywatcher Jackson Pharris took this photo of the moon, Venus and Jupiter over Los Angeles on Feb. 23, 2012. 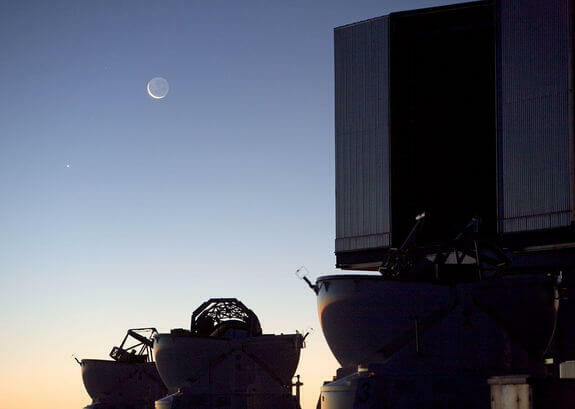 Moon and Venus Seen from ESO’s Paranal ObservatoryCredit: ESOAn evening view of the Moon and Venus above three of the Auxiliary Telescopes and one of the four Unit Telescopes of the Very Large Telescope at ESO’s Paranal Observatory in Chile. The entire disc of the Moon can be seen to be faintly shining in light reflected off the Earth, a phenomenon called earthshine. Image released Feb. 29, 2012. Moon with Earthshine over Paranal ObservatoryCredit: ESO/B. Tafreshi/TWANThe Moon and Venus shine above ESO’s Paranal Observatory in Chile. The entire disc of the moon faintly shines with light reflected off the Earth, a phenomenon called earthshine. Image taken October 27, 2011.